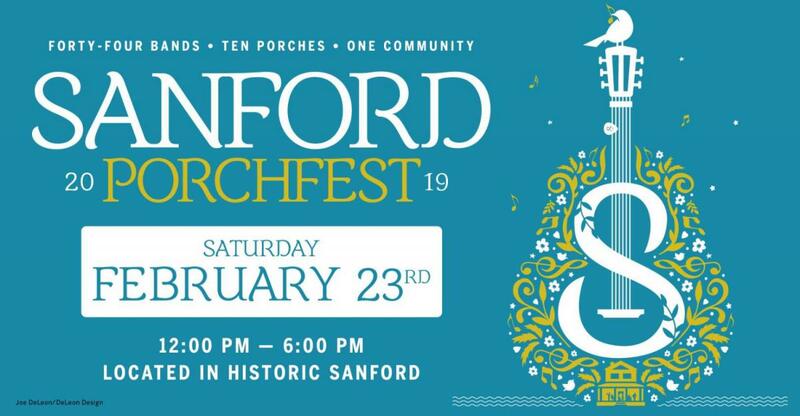 The 2nd Annual Sanford Porchfest Music Festival will feature 44 local bands / artists from all genres will perform simultaneously on ten front porches from 12:00 pm to 6:00 pm. Attendance is FREE and the festival is family friendly! Set up within walking or biking distance throughout the Sanford residential historic district, spend the day meandering between the porches, meeting new neighbors and experiencing all that Sanford Porchfest has to offer. Load up your bikes, pack a picnic, and join us as we transform the historic district into an artistic gathering space! No alcohol, please. Sanford Porchfest Corporation is a grassroots / local 501(c)3 non-profit that unifies the community through music and reinvests in the future of the arts. 100% of the festival proceeds (collected through sponsorships, general donations and merchandise sales) are donated back to the community in the form of scholarships to performings arts summer camps for underpriviledged children.